Q: How does your skin tan? 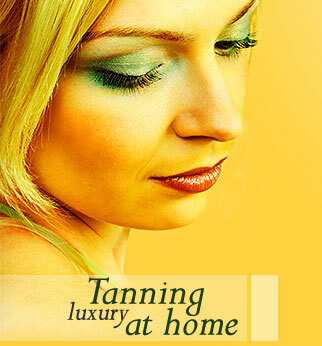 Whether you tan outdoors under the sun or indoors on a sunbed, the tanning process is the same. This natural process takes place when your skin is exposed to ultraviolet light. Here is an overview. Light is composed of energy waves that travel from the sun to the Earth. Each energy wave can be identified by its length in nanometers, (nm), which is one-billionth of a meter. Light can be broken into three general categories: infrared, visible and invisible. Ultraviolet light is in the invisible light spectrum. There are three kinds of ultraviolet light: UVA, UVB and UVC. Two of those categories, UVA and UVB, are used in indoor tanning equipment. Tanning equipment is designed to replicate UVA and UVB produced by the sun, but tanning lamps emit the light in carefully controlled and government-regulated combinations. As a result, the user has control over their exposure. That's why people face greater risk of overexposure tanning outdoors than they do by using tanning equipment indoors. Tanning itself takes place in the skin's outermost layer, the epidermis. There are three major types of skin cells in your epidermis: basal cells, keratinocytes and melanocytes. All play different roles in the tanning process. Everyone has roughly the same number of melanocytes in their bodies-about 5 million. Your heredity determines how much pigment your melanocytes can produce. Melanocytes release extra melanosomes whenever ultraviolet light waves touch them. This produces a tan in your skin. The tanning process is your skin's natural way of protecting itself from sunburn and overexposure. Calling a tan "damage to the skin" isn't telling the whole story. Your skin is designed to tan to protect itself. Most of us experience sunbathing as something very pleasant. The warmth and relaxation gives us a sense of well-being. But what is actually happening in the skin? The rays of the sun strike melanin pigments in the epidermis. These are darkened by the UVA rays in the light. The melanin pigments are formed by special cells lying deeper in the skin structure called melanocytes and then move with the surrounding cells to the surface. The darkened pigments absorb part of the sun's rays and thus protect the deeper skin layers. The UVB range of the sun's rays penetrates deeper into the skin and acts on the melanocytes themselves. These are then stimulated to form more pigments: thus creating the basis for a good tan. At the same time, the UVB rays cause the horny layer (the callus) to thicken. This thicker layer contributes towards protecting the skin. Tanning without burning - how does that work? The rays of the sun can, in addition to the desired tanning effect, also cause undesirable reddening of the skin, sunburn. For one-off sunbathing, the time required for tanning is actually longer than that required for skin reddening. Despite this, it is also possible to achieve a nice tan, without burning - quite simply by means of regular sunbathing. The reason for this is that the body reduces the preliminary stages of skin reddening relatively quickly, while the tan constantly builds itself up through repeated exposure. On the sunbed the exact intensity of the UV light is known. Consequently the tanning plan can be adjusted to ensure that the individual stops before burning starts and then that a good tan is built up through repeated exposure.